Please let me know what length fresh water hoses and sewer hoses that you've learned to carry based on the variety of campsite setups that you've experienced. I'm wondering if a 25' plus a 35' would cover most situations. Maybe you have learned that something different works better? I think my water hose is 25 feet, what ever the "standard white drinking hose" is and I've never had a campsite where I could not reach the spigot. I do carry an extra length of sewer hose. On several occasions I have had to use it because for some reason the sewer pipe would be way away from the pad. A second water hose would not be a bad idea. I also carry a Y-connector for the water hose spigot. Two reasons, first I can hook a garden hose up to wash off bikes without disconnecting the trailer and secondly, I can bleed pressure out of the water hose before disconnecting it and thereby not getting sprayed with water (most campgrounds around here have standard spigots and not the newer kind that bleed off the pressure). My water hose is a 25' collapsable. But I still carry a 50' white hose in the truck toolbox. I use the Zero-G hose. It's like a wet noodle when empty, then firms up when under pressure. The fittings are top notch. I bought the 20' sewer hose that comes in two sections. I find most campgrounds only need 10'. If I need more, I'll attach the second half. For years I carried a 15' section and never wished for longer. we carry three 25' water supply hoses. we have been a many campgrounds over the years. We have almost 2,000 nights of Airstream camping experience. Over 90% of the time, one hose does the trick. We occasionally use two of the hoses. On about a half dozen occasions over the years we have had to use all three hoses. We also carry two 25’s in case we need extra length. Also a Y connector, short hose section and sprayer for rinsing. Don’t forget a water pressure regulator! Although many campgrounds have them, and AS’s May or May not have them internally installed, you should always use one to avoid over-pressure issues. We carry a 25', a 50' and a 4'. We also have a couple of Y's, pressure regulator and back flow valves. Over the years we have acquired and used all of these from time to time. Generally a 25 foot hose will handle most campsites. We carry a total of 100 feet of fresh water hose for when we camp at Forest Service campsites and standpipes are random. That way we can reach the water pipe and fill our fresh water tank. We also carry a “water thief” because often the faucets are not threaded. Also a “y” valve and an anti-siphon (backflow) device. We also carry an in-line water filter. We carry two 25' fresh water & two 10' sewer hoses. On occasion we need all for a connection. Caz. I carry three 25ft fresh water hose. Call it A, B and C for this thread. B is my secondary in case my primary breaks OR if I need to extend it. C is my OH $hit, I need it. I do the same for my sewer hose. I carry three 10ft section. Same use as above. 25' and 35' water hoses with back flow preventer and pressure regulator Y, as well as valved and full-flow Ys for daisy-chained rally camping. Two 20' sewer hoses. I've used them all at various times. Perhaps more important is the 30' 30 amp extension cable. I've read bad reviews about this Zero G hose from the connections being cheap and breaking. How long have you had yours? I really would like something like this house that's easier to store than the standard white hoses. Curious if you think it will hold up. Thanks! 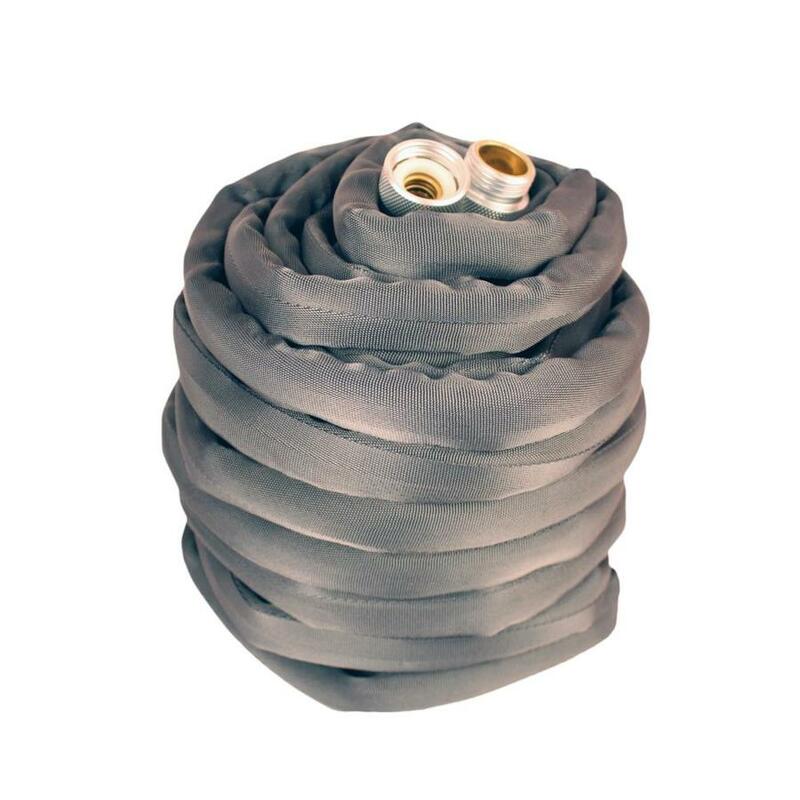 We carry two 25' white water hoses with a camco blue filter in the middle. I just automatically connect that way when we need water, although we travel with a full fresh tank and many nights I don't connect to the spigot at all. I replace the filter every spring, but the hoses every other year. I carry a 50' collapsible utility hose in the bumper box. It's used for everything from washing the dog, to washing the trailer to sewer flushing. I throw it out and replace it every spring. We carry two 10' stinky slinky sections. I usually only need one since we usually camp at parks w/o full hookups and most dump stations work best with 10'. I have not had to replace that setup yet. Maybe this is the year since they are now 4 years old. I think you forgot about one extension that is vital to us. We can usually work around or do without water and sewer extensions. However, we have had a few occasions where we needed a 30 amp extension cord. We carry a 25'. If you live or travel in the south, that can be a life saver on a night when you expect power for AC but find the pedestal is more that 25' from your trailer's closest connection. Water hoses: Buy two 25' hoses and a set of male/female connectors and make a 15' and a 10' hose. At most park connections the 10' will suffice. Electrical: Look for 10',15', and 25' or 30' ready made cable. You may have to change the ends to match your RV. Sewer hose: Use a twenty foot if that length will fit you holder. If nor get two shorter hoses and a male/female connector. If you have a compost toilet just buy two cheap grey water hoses and cut one for 10' to reach the dump or the nearest flower bed. At 90% of the stops you will only need the 10' lengths and they sure are less cumbersome.